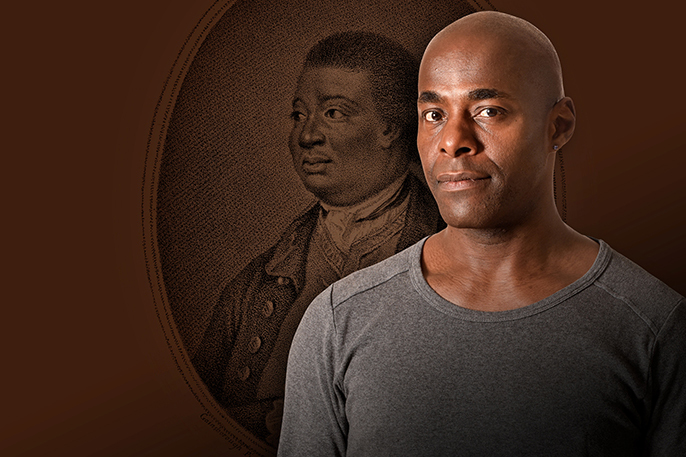 Paterson Joseph’s elegant one-man show Sancho, An Act of Remembrance, celebrating the extraordinary life of Charles Ignatius Sancho will receive its first full scale production this September starting at the Oxford Playhouse before touring to the Birmingham Rep. These two-dates in the UK are prior to a tour in the USA that includes dates at BAM (Brooklyn Academy of Music) and the Kennedy Center in Washington DC. As Sancho prepares to sit for Thomas Gainsborough, leading portraitist of eighteenth-century English society, we are granted a rare insight into his truly remarkable story; that of a composer, actor, social satirist and general man of refinement; a story that casts new light on the early African British experience. One of the UK’s finest actors, Paterson Joseph carves an astonishing story from this significant life. Born on a slave ship, but never a slave, Charles Ignatius Sancho led a remarkable life becoming life-long friends with the actor/theatre manager David Garrick, being immortalised by Gainsborough and becoming the first British-African to vote in Britain. This brand new main stage production will premiere in September and will be touring until February 2016.